CLICK HERE - For Intimate Private Weddings & Receptions up to 149 guests – Valara offers worry free and easy to plan packages to suit the tastes of our many esteemed wedding clients. 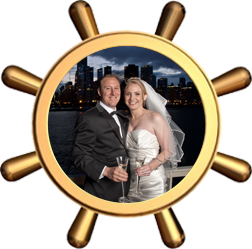 Click on ships wheel for information on making your special day easy to plan. Be sure to review our wedding testimonials and wedding photographs! CLICK HERE - Chicago’s favorite private client and employee entertaining yacht, Valara is sure to please and impress for all of your entertaining needs. 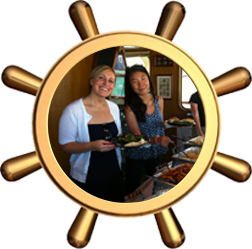 Click on ships wheel to learn about our time saving, planning made easy packages and review our corporate client testimonials! Corporate entertaining for 30-149 guests. CLICK HERE - The reasons for private family entertaining and other celebrations are endless. Valara is sure to make all of your special celebrations memorable. 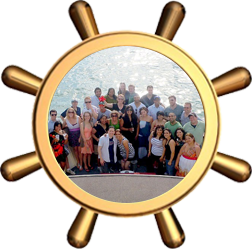 Click on ships wheel to view our planning made easy packages and our client testimonials. Private upscale entertaining for 30-149 guests. Reasons to celebrate aboard Valara. Celebrate with us! Our night aboard the Valara VI yacht with Adventure Sea Tours was incredible. . . Big thanks to the crew on board that night and especially to Mary Antoniette who made the whole booking process easy. On behalf of all of us, especially our new family, we wanted to say "Wow", and let you know the wedding event on the beautiful Valara VI was nothing short of "Magical."